SAN FRANCISCO, Oct. 16, 2018 — AppsFlyer, the global leader in mobile attribution and marketing analytics, announced today that it surpassed $100 million in Annual Recurring Revenue (ARR) in the third quarter of 2018, growing at 100% every 12 months. Driving the company’s revenue growth are the 85,000 apps whose marketers use AppsFlyer’s products and services, propelling the company to over 70% market share worldwide. The company’s revenue figures follow a string of recent plaudits for the company and considerable growth across key benchmarks. In the past year, AppsFlyer has continued to form partnerships with many prominent brands, including eBay, NBCUniversal, Adidas, Hyundai, and Coca-Cola. AppsFlyer’s technology is now found on nearly 7 billion mobile devices, up from 4.5 billion devices at the same time last year. During Q3 2018, AppsFlyer’s media spend measured increased to $17 billion annually, an 89 percent jump from $9 billion last year. At the same time, AppsFlyer’s continued innovation of anti-fraud solutions resulted in significantly higher savings for marketing departments using AppsFlyer’s technology – blocking an estimated $6.5 million a day of ad fraud. 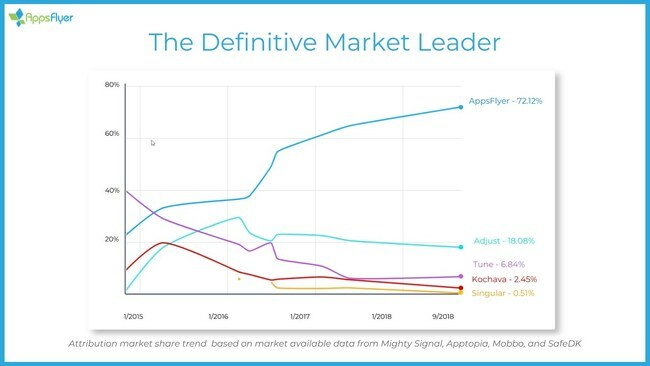 Attribution market share trend based on market available data from Mighty Signal, Apptopia, Mobbo, and SafeDK. Goldman Sachs identified Kaniel as one of the “100 Most Intriguing Entrepreneurs” of 2018, and AppsFlyer was named the Hottest Marketing Technology Startup of 2018 at the Europas. The number of employees at the company has doubled from 230 last year to 465, in 15 offices around the world.